This quote was the extent of my Eckhart Tolle knowledge and it all seemed to reek of woo. Upon learning, however, that Gillian Anderson was a fan and that Tolle’s The Power of Now and A New Earth have sold over 2 million copies and 5 million copies respectively, I realized that Eckhart Tolle’s work must actually resonate in a significant way. Before he became a spiritual guru, Eckhart Tolle was an academic who had been suffering from anxiety and depression for years. Born Ulrich Leonard Tölle in 1948 to lapsed Catholic parents in small-town Germany, he immediately entered a world of chaos and strife. Eckhart’s parents fought frequently and he was bullied at school. The bombed-out buildings of Germany’s post-war landscape contributed an ongoing sense of sadness to Tolle’s anxiety as a child. He was also consumed by worry about whether he would be able to make something of himself or whether he would wind up a disappointment to his mother. Tolle often summarizes his childhood as unhappy. Eckhart’s parents eventually separated and at age 13, he went to live with his father in Spain. His father did not force him to go to school, so he pursued his own interests at home, studying literature and philosophy. At age 15, he was gifted five books written by a German mystic Joseph Anton Schneiderfranken, also known as Bô Yin Râ, which he’s said was formative for him. At 19, he moved to London to teach German and Spanish as a foreign language. Still struggling he continued searching for answers. After completing a degree at the University of London, he enrolled at Cambridge as a post-graduate student and was invited to do research on campus. However, Tolle became consumed by anxiety and submerged into a bout of suicidal depression at age 29. The academic renewed his pursuit of spirituality, drawing on Buddhism, the Bible, and Zen. He stopped studying for his doctorate, and spent about two years staying with friends, occasionally at Buddhist monasteries, and at times sleeping outside. Tolle changed his first name in homage to a Christian, but “very Buddhistic” mystic Meister Eckhart, who lived in medieval times. People began to ask him about his beliefs and “sitting on park benches,” he eventually wrote and published his first book The Power of Now in 1997. The initial run sold poorly, but was nevertheless re-released in 1999. The popularity of his work exploded in 2000 after Oprah recommended his book in her magazine. 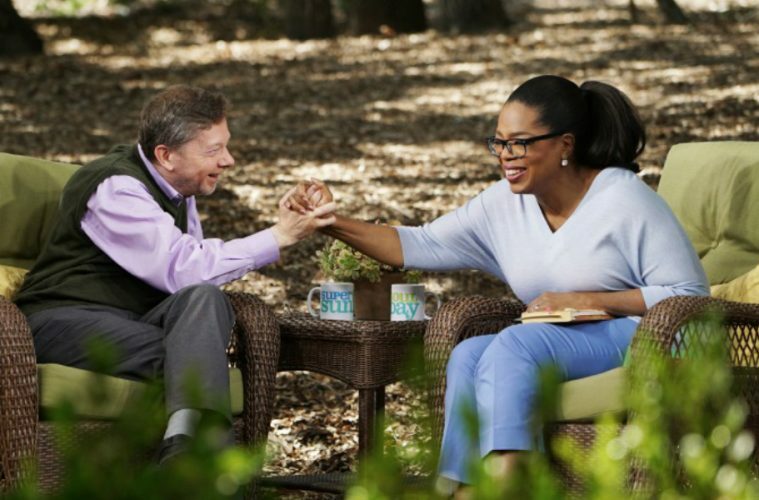 Over the course of several years, Tolle released several more books and maintained a regular presence on Oprah’s reading list, cementing his status as one of the most influential spiritual teachers of all time. Innovation has also been a hallmark of Eckhart Tolle as a self-help guru. Following up on the increased reach of Oprah’s cosign, he began disseminating his teachings via online webinars, monthly group meditations, and more recently YouTube videos on trending mental health topics, as well as in-person seminars and retreats. His books and teachings work well in conjunction with his wife and professional partner Kim Eng’s collection of teachings on “presence through movement” (a practice based on tai chi, yoga, and qigong). In addition to Oprah and Gillian Anderson, Jeff Goldblum, Meg Ryan, Annie Lennox, and Cher are all said to be fans of his work. Paris Hilton even took a copy of The Power of Now with her when she went to jail. Eckhart Tolle’s writing can honestly be baffling and hard to discern, but it can also be enlightening, articulating things that are somehow so self-evident they’re difficult to understand. It lends itself to having very flexible interpretations, which might be a quality that could be particularly appealing to those who feel constrained by traditional religion or who have left religious abuse. I was skeptical at first, but ultimately, (I think) that Eckhart Tolle’s work can be summarized like this: “Life will give you whatever experience is most helpful for the evolution of your consciousness” “Life can only be experienced in the moment.” It’s a good sentiment, even if it’s kind of woo.